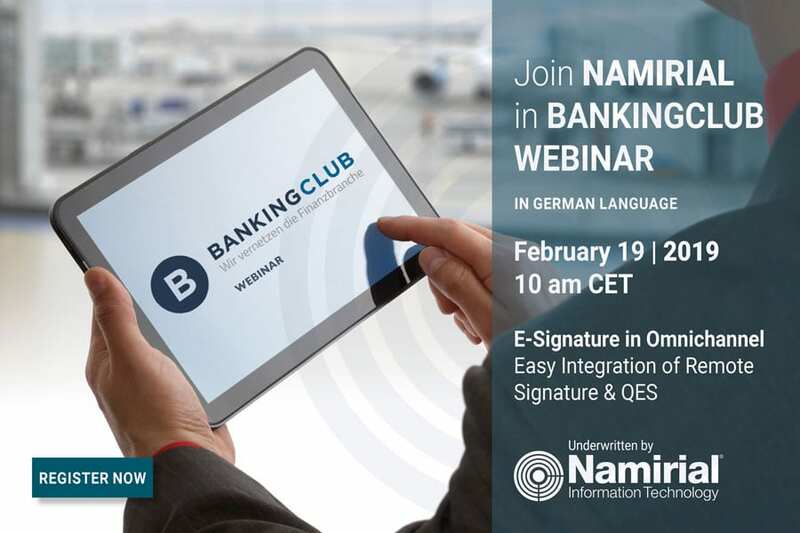 This webinar is a follow-up Bankingclub Signature Day 2018. It will be addressing various requests of executives from financial institutions to provide more in-depth information on consumer loan agreement conclusion in the omnichannel for both – existing and new customers. Signature experts Johannes Leser, Ralph Maute and Jörg Lenz of Namirial Germany, supported by Uwe Stelzig of Namirial partner Identity Trust Management, will be discussing current legal, technical and organisational requirements on European and national level for digital end-to-end processing of consumer loan agreements. The expert team will provide guidance on compliant options for identifying (legitimizing) and authenticating customers as well as concluding legally binding contracts. Insights will be given why and how offerings of trust service providers (TSPs) across Europe vary in their user-friendliness. The webinar will also focus on best practices in digital certificate provision and how existing legitimation of own customers or customers of other financial institutions might be used for this purpose. Another topic discussed is the user-friendly integration of qualified electronic signature (QES) into contract workflows. Some credit institutions and insurance companies in Germany have already integrated procedure into their processes. Qualified electronic signatures are mandatory for legally effective digital conclusion of consumer loan in Germany. Finally, QES can be easily integrated into existing processes, in both direct and indirect customer contact. Wherever no QES is required, advanced electronic signatures and seals provide significant evidence of conclusiveness, authenticity and integrity of electronic documents. Last, but not least, the webinar will highlight how remote signatures and remote seals help to make signature acquisition much faster, more user-friendly and more cost-effective: since EU Regulation 910/2014 eIDAS went into force the cumbersome provision of certificates on smart cards or USB tokens is no longer required. Today certificates are easily retrieved online from Hardware Security Modules (HSM) whenever esignatures are required. The webinar will be provided in German language.